EUS-guided liver biopsy continues to grow in popularity as an alternative to transjugular and percutaneous approaches used to assess disease status in patients with chronic liver disease or cirrhosis. 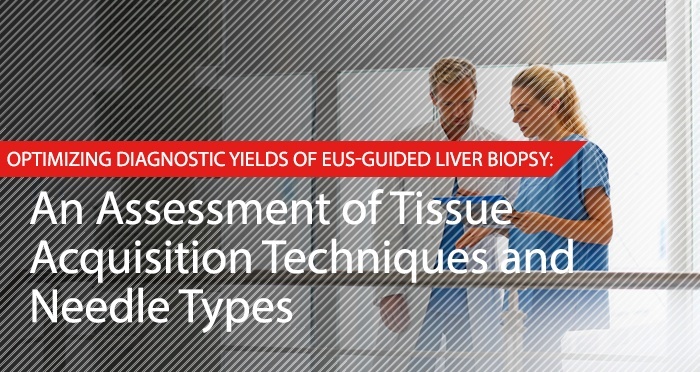 However, the diagnostic accuracy of EUS-guided liver biopsy is widely discrepant due to differences in methodology, namely, needle size and design and tissue acquisition techniques. In particular, clinicians’ methods of tissue procurement vary in their degree of suction (if any), number of needle passes, and use of the “fanning” technique (acquisition of lesions in multiple locations). The objective of this study was two-fold: to compare hepatic histologic yields of two percutaneous needles and four different EUS-based needles, and to determine the amount of suction and number of needle passes required to produce the optimal diagnostic yield. Six needle types were used, in randomized order, to perform consecutive liver biopsies on non-diseased human cadaveric tissue: one 19G FNA needle, one existing 19G fine-needle biopsy (FNB) needle, one novel 19G FNB needle, one 22G FNB needle, and two 18G percutaneous needles (18G1 and 18G2). Two needle excursion patterns (one vs. three fanning passes) and four distinct suction techniques were performed on all EUS needles. Six of each needle type were tested under each condition and alternated between the right and left sides of the liver. The average number of portal tracts (partial or complete) served as the primary outcome measure. Secondary outcome measures included specimen adequacy and degree of sample fragmentation. Specimen adequacy was defined as the presence of ≥ five portal triads or a length of ≥ 15 mm. Fragmentation was characterized as core, pieces, or fragments, in decreasing order of length. Forty-eight (48) liver biopsy samplings were performed per needle type, resulting in a total of 288 samplings (144 from each liver). The novel 19G FNB needle was associated with a significantly higher mean number of portal tracts (6.2) compared with all other needle types (P < 0.001). The 22G FNB needle was associated with significantly more portal tracts than were the 18G1 percutaneous needle (3.8 vs 2.5; P = 0.05), the 19G FNA needle (3.8 vs 1.9; P = 0.004), and the existing 19G FNB needle (3.8 vs 1.7; P = 0.012), but not when compared with the 18G2 percutaneous needle (3.8 vs 3.5, P = 0.68). FNB needles and the use of three fanning passes were found to be independent predictors of the number of portal tracts obtained (P < 0.001 and P ≤ 0.016, respectively). Location of biopsy sampling (right vs. left side of the liver) and suction technique were not independent predictors of number of portal tracts obtained. In terms of fragmentation, the mean percent of core samples obtained was greatest for the novel 19G FNB and the 22G FNB (84% for both), followed by the percutaneous 18G1 (44%), and percutaneous 18G2 (77%) needles, with no statistically significant difference among the needle types. Specimen adequacy was highest (85.4%) for both the novel 19G FNB and 22G FNB needles. This was statistically superior to the mean specimen adequacy produced by both other 19G needle types (P < 0.01), but not statistically different from that of either percutaneous 18G needle type. Among its many advantages, EUS-guided liver biopsy provides a less painful approach for patients, while allowing for a comprehensive evaluation of the GI tract. The novel 19G FNB needle provided superior histologic yields when compared to 18G percutaneous needles and other 19G FNA and core needles; these yields were deemed sufficient for histologic evaluation of parenchymal liver disease. Furthermore, the 22G FNB needle was found to be comparable or superior to percutaneous needles in terms of yield, and therefore, may be an acceptable alternative for liver biopsy sampling. More studies are needed to corroborate these results and to evaluate the role of suction and the optimal location of biopsy specimen in EUS-guided liver biopsy, as well as to determine its overall cost-effectiveness. Schulman, AR; Thompson, CC; Odze, R; Chan, WW; Ryou, MR. “Optimizing EUS-guided liver biopsy sampling: comprehensive assessment of needle types and tissue acquisition techniques.” Gastrointestinal Endoscopy 2017; 85(2): 419-26. Accessed March 7, 2017.